I’m usually not too fussy when it comes to measuring ingredients, but I really prefer to use a kitchen scale to weigh out ingredients when I bake cakes. If you have a scale, I suggest using the weight measurements listed in the recipe. Also, the amount of frosting in this recipe is enough to cover the cake, but I made a double batch. If you are okay with leftovers, doubling the recipe isn’t a bad idea so you have extra buttercream to work with. Make the cake: Preheat the oven to 350 degrees. Butter three 8-inch round cake pans and line the bottoms with parchment paper cut to fit. Then butter the tops of the parchment paper and flour the pans, tapping out any excess flour. Set aside. In the bowl of a stand mixer fitted with the paddle attachment, mix the sugar, flour, cocoa, salt, baking powder, and baking soda on low to combine. In a separate bowl, whisk together the eggs, oil, and milk. With the mixer on low, slowly pour the wet ingredients into the dry ingredients, until just combined. Then slowly pour in the coffee and mix on medium low speed until the batter is smooth (it will be very liquidy). Scrape down the beater and the bowl with a rubber spatula and make sure everything is well combined. Divide the batter evenly between the three prepared cake pans. Bake for 35 to 45 minutes, until a cake tested inserted in the center of each cake comes out clean. Place the cake pans on a wire rack to cool completely. Once the cakes are cool, turn them out of the pans and use a serrated knife to level the tops of the cakes. Make the frosting: In the bowl of a stand mixer fitted with the paddle attachment, whip the butter on medium speed for 8 minutes, until the butter is pale and creamy. Add the confectioners sugar, milk, vanilla extract, and big pinch of salt. Mix on low speed for 1 minute and then increase the speed to medium and mix for an additional 6 minutes. 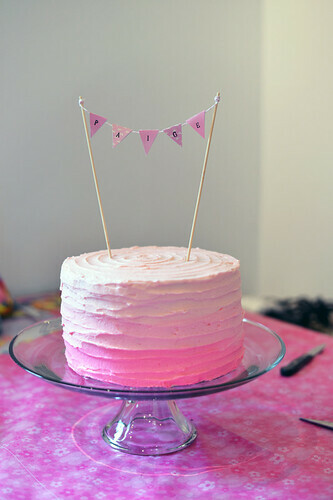 Divide the frosting into 4 bowls and tint 3 of the bowls differing shades of pink, leaving 1 bowl of frosting untinted. 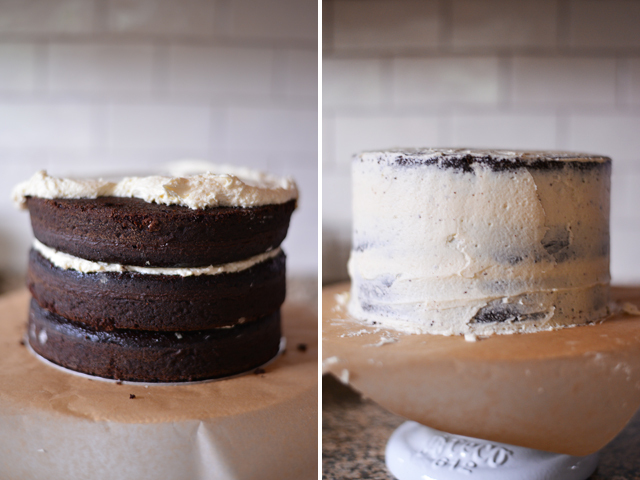 Assemble the cake: Stack the cakes together with a layer of untinted frosting between each layer of cake. 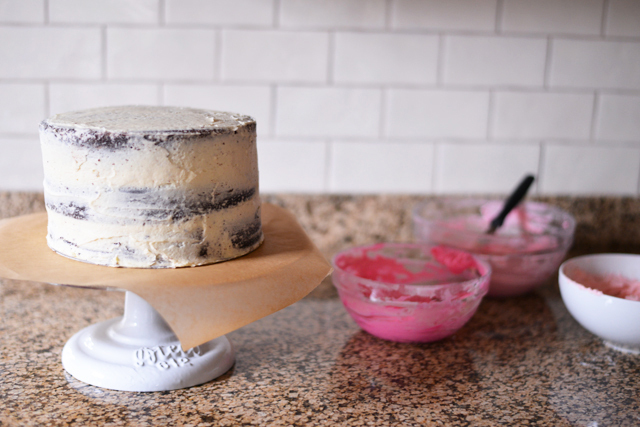 Then crumb coat the cake with a thin layer of untinted frosting and place the cake in the fridge for about 30 minutes, until the crumb coat is firm to the touch (crumb coat tutorial here). 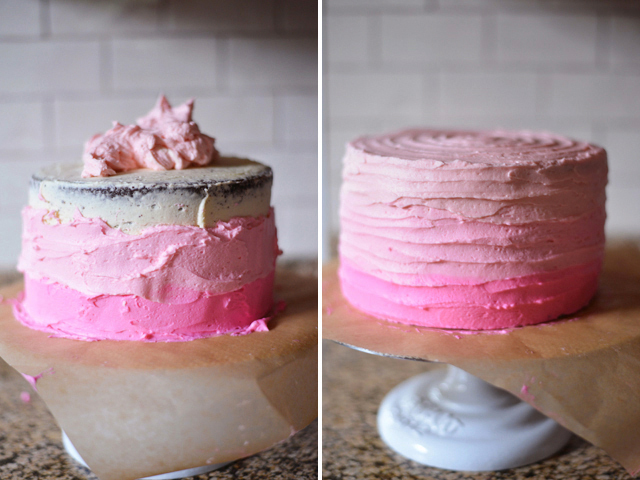 Frost the cake with the pink tinted frosting, starting with the dark pink on the bottom of the cake and working your way up the cake with the lighter pink frostings (ombre frosting tutorial here). Makes one 3-layer 8-inch round cake.